Get the chic style with this Chicago Standard Name Badge. This stylish name badge features full color logo and standard round corners with engraved 1 line personalization on a non-metallic 2 ply plastic and jeweller’s pinback as standard. Get the chic style with this Chicago Standard Name Badge. 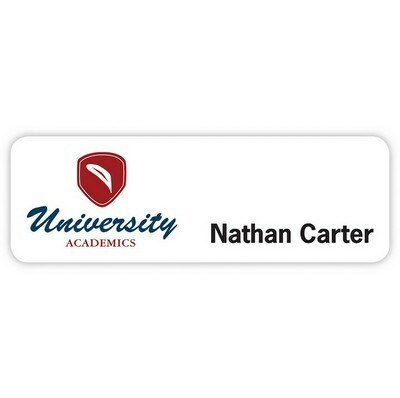 This stylish name badge features full color logo and standard round corners with engraved 1 line personalization on a non-metallic 2 ply plastic and jeweller’s pinback as standard. Additionally, you also get multiple options like square corners, bevelled edge, alternate magnet attachments and additional lines of customization. This classic name badge is ideal for tradeshow, conventions, conferences and meetings. Imprint your logo and message on the entire badge. Highlight your corporate identity and promote your brand in classic style.